Looks like Google has rolled out some improvements with the Google Maps support of KML. Some of the improvements are support for exported photo sets out of Picasa (meh), view KML overlays (wonderful) and customized marker icons. Google has posted some examples of the KML overlay and the customized marker icons, but I’m sure you can find many more examples out there. 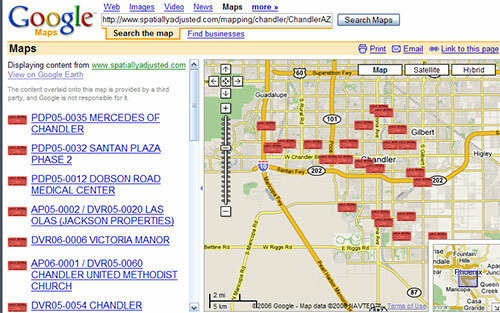 Look how much better my Chandler, AZ zoning signs KML looks now in Google Maps. Rather than push pins, you see the actual Chandler Zoning signs. Sweet! I think all Arc2Earth users are going to be very happy about this as Google Earth is not required to view KML/KMZ and you don’t have to worry about installation or licensing.